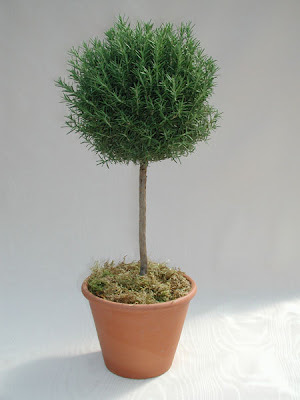 Yesterday I was at Target and I saw these rosemary plants and I thought they would be perfect to make little topiaries. This is a project I have wanted to try for a long time. I want the pots to get mossy which is not always easy when you live in a dry climate. I've heard if you brush plain yogurt or buttermilk on the pot and then rub moss on it that it will grow moss quicker. I'm not sure how great the moss will grow since the rosemary needs full sun! I didn't think that part through until after I did it. I removed all the stems except the strongest center stem and then removed all the leaves except for the very top. I pinched off a little on the top which will make the plant send off two new branches and you just keep pinching as they grow until you get a little ball shape at the top. Here is a photo I found of what they should look like....although it may take a year or so to get there. I'll keep you updated on it's progress. 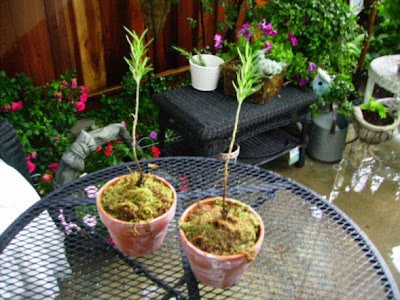 Click here to find directions for starting them from just a clipping of rosemary. Good luck with those! 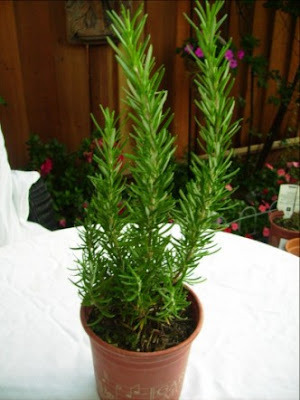 I love rosemary, it smells great and I love it for cooking with. My Target stopped carrying live plants about a year ago. Neat project - keep us posted on their progress! Please post pics when so we can see the progress. Oh I love topiaries! I cant wait to see them progress :) Good luck!! Let me know how that works. I have always heard you could do that with yogurt. I love Rosemary, well you know why. This is a great project. I also love rosemary. I have a good size bush outside. I think I will go take some clippings and give it a try. One of the best things about California is the way you can grow rosemary and lavender into hedges ( and topiaries). And you can pick eucalyptus from trees...cool! Just blows the mind of a New England girl. I hope it works for you. I love that whole mossy look on pots. You can do it...looks like they will be just what you want them to be. It will be interesting to see if your moss grows. I've heard that it works. Looks like a fun project, may have to try one sometime. My classroom has the perfect windows. Good Luck. 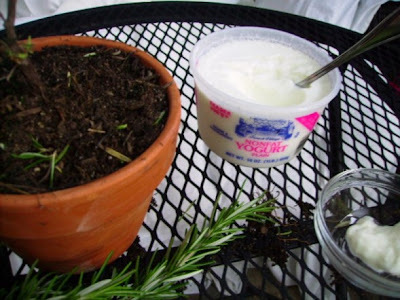 I mixed the yogurt with some potting soil and painted in on. It took several weeks but it worked. I even painted some on a few of my garden statues to age them. I live in a very humid climate so I'm sure that helped the moss to grow too. Isn't it funny how just the smell of rosemary lifts your spirits? It sounds like a great project, especially as you can probably keep it outside year round in CA. If you can't grow moss on the pot itself, at least you can buy some at Michael's and cover the potting soil. Good luck! I love Rosemary too! A few years ago I went to a small German town called Fredericksburg over Easter and the main street which was lined with small quaint specialty stores was also lined with huge Rosemary bushes. They were so beautiful and so fragrant! Hi Cindy, I've wondered how to do this. Looks like you're off to a great start! I also want to tell you how beautiful your Noritake is! What a great find! Thank you SO much for showing a tutorial on those topiaries.....say that 5 times. I always wondered how they did that. I may have to try that now. Fabulous, as always. I have got to try the yogurt thing!!!! oh, that is a neat project. I've always loved those rosemary topiaries. You'll have to keep us posted on its progress. I'm cooking with rosemary tonight! For some time now I have wanted to try the buttermilk/yogurt project on a few of my pots. You have now inspired me to get busy! I love the topiaries - good luck with them! I am sure they will be as lovely as the one in the photo. Gread project and very inspiring. I have been looking at faux rosemary topiaries at Marshall's but they were over $25 each and I would like 2 on either side of my kitchen window so I haven't gotten them. Next week I will check our Target to see if they have the plants there. I love topiaries too and rosemary! I had some in my kitchen years ago but they didn't make it. I would love to try them again! Good luck with yours!